A collection about the art of fiction. After the influential Argentinian writer Cortázar (1914-1984) had written his greatest and most significant works, he accepted a position at the University of California in 1980 to deliver a series of classroom talks. The first one, “A Writer’s Paths,” is autobiographical. He confesses that he’s “not systematic, I’m not a critic or a theorist, which means I look for solutions in my work as problems arise.” He passed through three stages as a writer: the aesthetic, when he was reading extensively, including Borges, who was for him a “literary heaven”; the metaphysical, which was a “slow, difficult, and very basic inquiry…into man [and his]…destiny”; and, finally, the historical, during which he realized that he had to confront his Latin American roots, its history and politics. Other talks take up the topic of the fantastic, referencing writers like Ambrose Bierce, W.F. Harvey, and Oscar Wilde. Two talks explore Cortázar's Hopscotch, A Manual for Manuel and Fantomas. He goes into great detail about how he wrote his stories and novels and reads extensively from them, sometimes entire stories. There are some tips/advice for young writers to consider, but not very much. 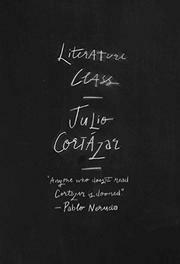 Cortázar had some notes, but generally these talks are delivered extemporaneously. Though impressive, sometimes they ramble and lose their way, and sometimes they just get dull. Because the lectures are transcribed as is, the book would have benefited from some judicious editing—e.g., leaving out matters concerning office hours. Some kind of introduction would also have been useful. In every talk (during and after), Cortázar takes questions from the students, which are included. His responses are carefully thought out, some going on for pages. It’s great to have these insights from the author himself about his writings, but it’s a bumpy ride for all but a small, scholarly audience.